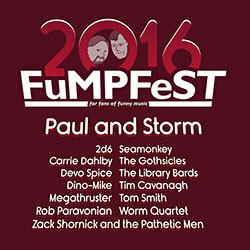 These are the shirts we created for FuMPFest 2016, featuring the FuMPFest 2016 logo, the cartoons of Paul and Storm, and the full guest list, printed on a high-quality, deep maroon colored t-shirt! We have a limited number of sizes available. Get your orders in quickly if you would like one.